Sitting at the top of the range of cruisers offered by Triumph, the English bike manufacturer, is the Rocket III bike. Taken off sale in the Indian market some time back, this bike will now be getting a new generation update which is rumoured to be launched in 2019. Built on a completely new platform, the initial sketches of the bike were displayed to dealers in the month of October. This bike, when launched, will be aimed against the Ducati Diavel cruiser. To be equipped with a 2.5-litre inline-three engine, this bike will be generating much more power and torque than the Italian cruiser. The huge 2.5-litre engine will develop more than 180 bhp but cruisers are more about torque and not the power figure. The engine develops a twisting force of 230 Nm which will be available from 3,000 rpm. That said, this Rocket III is not a straight line performer but will take twists and turns like a boss. Anchorage duties are done by Brembo M50 callipers on 330 mm disc brakes on a new cast front wheel. The rear wheel also gets a new design is mounted on a new single-sided swingarm. Tech aids on the bike will include traction control, high-spec cornering ABS and multiple rider modes. Also expected is a TFT screen for the instrument console which will provide enough information to the rider. The Rocket III will also get a deep scalloped seat, holding the rider tight in the seat under strong acceleration. The pillion rider would need to grab the rider tight or else risk flying off the back end of the bike. 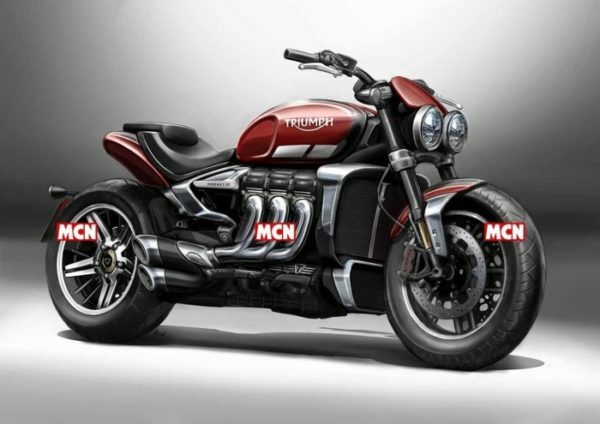 While Triumph is yet to confirm or deny if this bike will come out but reports suggest that the bike will be launched in 2019. Once after the international launch the bike the is very likely to make its way to the Indian market. Stay tuned for more updates on the bike. Below is an image gallery of the older Triumph Rocket III.